Over the years, I’ve talked to many people about credit cards — how they work, who pays what, and so on. Nine times out of ten, the people I talk to don’t know what those strips of plastic actually do. When I tell them, they look at me skeptically because all the commercials they’ve ever seen remind them how convenient credit cards are, how they can get “points”, “rewards”, “cash back”, and other childish notions. Otherwise reasonable adults who understand that there is no free lunch believe that there is a free lunch in their credit cards. Thousands of advertisements tout some version of the claim that the retailer featured in the ad “eliminates the middle-man” to save you money! But when it comes to credit cards, our society has embraced the biggest and most expensive middleman of all — we pay for a way to pay! Every time a retailer accepts a credit card, she pays at least two fees. 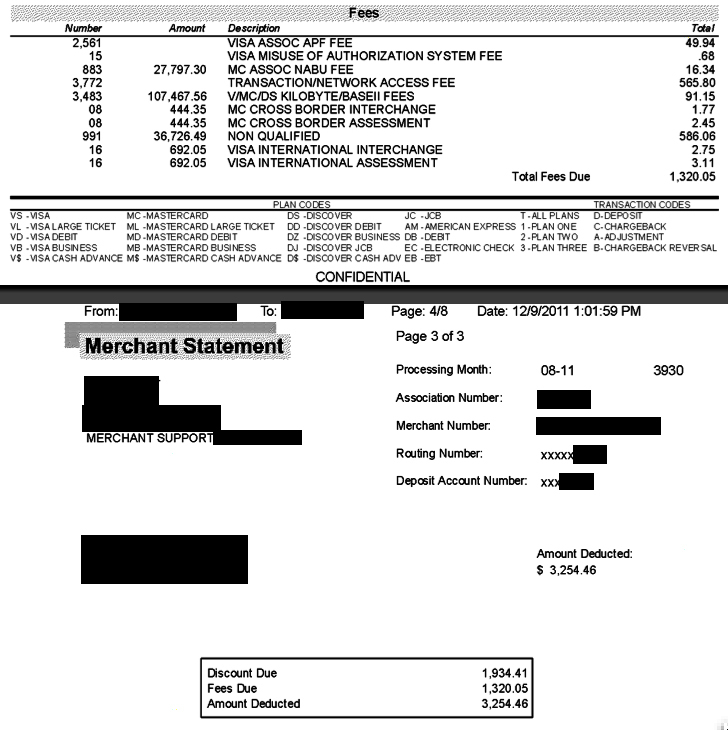 She pays a flat rate for the transaction when her credit card unit calls a processing computer somewhere in the country, and she pays a percentage of the amount charged. If the sale was for a delivery order made over the phone, she pays a higher fee. If a debit card rather than a credit card was used, she pays extra for that, too. So, for example, if you buy some bi bim bop at you favorite Korean restaurant and pay with a credit card, you think you’ve spent $10 plus tax plus tip — say, $12.95. To collect that $12.95, the restaurant owner spent roughly 40¢. That might not seem like much, but those fees add up. If you order bi bim bop every week and pay with a debit card, she will spend $2 just on fees. Well, she has to cover that expense somehow. So she bumps up her prices a bit. The bi bim bop then costs $10.25. Sales tax goes up 2¢. And of course, the fees also go up. You, the customer, lose; the restaurant owner loses; but the credit card companies win. For decades, I worked at what could be characterized as a medium-sized small business on the north side of Chicago. I watched over the years as cash sales declined and credit card sales ballooned. Below are portions from one credit card statement for one credit card unit for one month. Naturally, I’ve blacked-out information identifying the business and the processor involved; but the numbers are still impressive. $3,254.46 to process $107,467.56 of sales from just one of three sites in one month. 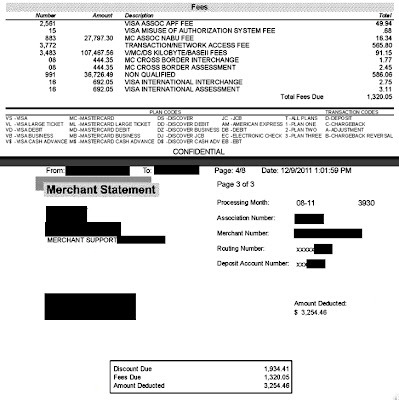 For the entire year, credit card sales through that one unit cost the business over $30,000.00. That statement, and millions of others like it, help to explain why credit card companies enjoyed huge profits during the worst economic downturn since the Great Depression. The antitrust settlement involved charges that — surprise! — credit card companies and major banks conspired to rig the fees paid by retailers! Whoda thunkit?! The defendants, which include most of the major U.S. banks, will pay $6 billion to Kroger, Safeway, the National Association of Convenience Stores and a very long list of trade groups and small businesses. And believe me, that $6 billion pales in comparison to the money taken in by the conspiracy. Reportedly, the case dates back to 2005; but I suspect that has more to do with statutes of limitations than with prior, honest competition. I’ve lost count of the number of salesmen from credit card processing companies who tried to get my business. Every one of them promised to save me money; but in the end, every one of them had the same scheme. I could pay a little less for each phone call and a little higher percentage of the sales, or I could pay a slightly smaller percentage of the sales and a little bit more for each call. But the differences were insignificant in the long run because the overall fee structure was fixed. No processor would genuinely save me money because that would reduce their profits. None of these issues arise if you simply buy your bi bim bop with a twenty and some change. Pay with cash and you’ll never have to check your statement to see if you were accidentally — or intentionally — overcharged. Pay with cash and you’ll never worry that a waiter or a cashier or a drunk at the bar stole your credit card number. (Credit card fraud, by the way, long ago passed personal checks as the leading form of retail theft.) Buy bi bim bop and pay with cash — and the Korean restaurant owner won’t have to spend part of her tip for the obligation to keep your signed receipt for the next eighteen months. In the past 30 years, I’ve flown to Washington, D.C. once and to Texas several times. I’ve taken the train to Tennessee. I’ve booked hotel rooms in all three places, and I don’t have a credit card. Cards make sense if you must buy something now that you can’t pay for immediately. But really, how often does that happen? I’ve seen people pay for a $2.50 cup of coffee with plastic. That’s stupid. I’ve seen people buy groceries with a credit card. I’ve seen people pay for a hamburger at a fast food joint with a credit card. Six out of ten Americans are in debt, mostly because of credit cards; and they just don’t get it. Help yourself out. Help out that local restaurant you love so much. Help out everybody. Cut the cards. As an extra, added attraction, the business then had approximately 42,000 individual credit card slips to store for 18 months — in case a dispute cropped up. And of course, that credit card paper isn't free.